This one is Jean’s recipe. It is a very simple but yet delectable dessert. 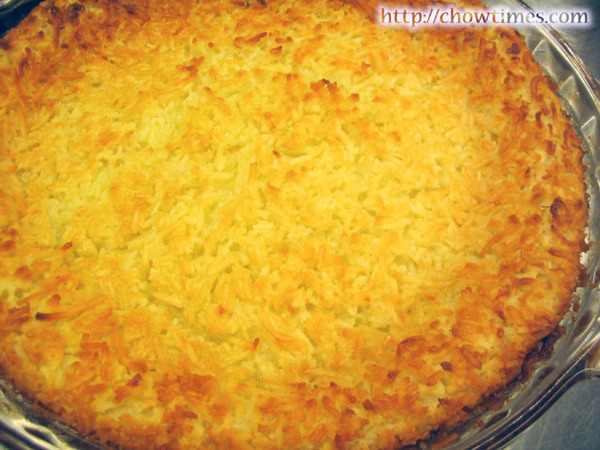 The Impossible Pie is crispy on the outside by the brown coconut flakes and creamy in the inside like an egg custard. Anyone know why this is called the Impossible Pie? Perhaps its because it is impossible to go wrong with this pie. The instructions are so simple that I do not have to post any pictures to illustrate them. Pour all the ingredients into a blender and blend for a few minutes. 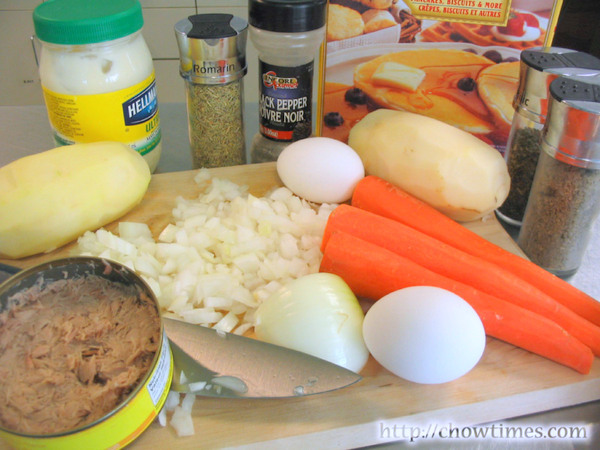 Pour the mixture into a greased 9″ pie plate and bake in a 325F preheated oven for 40 minutes or until a knife comes out clean when inserted into the pie. Minoo made a Vegetable Pancake in her cooking class at the Caring Place. If you have problems getting your kids to eat vegetables, like mine, the Vegetable Pancake is a good way to get them to eat it. This pancake is crispy which somehow camouflages the vegetables in it. 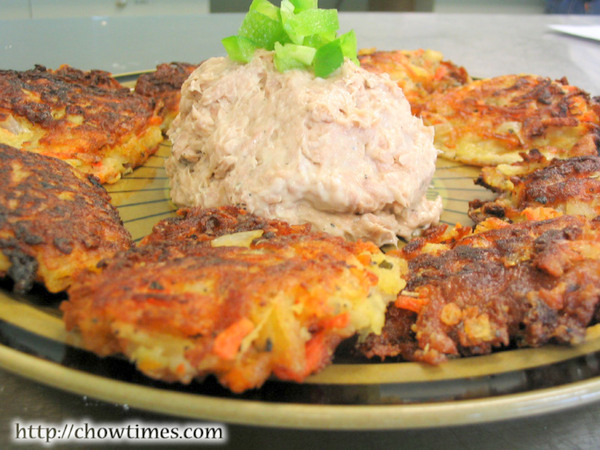 The tuna topping gives the Vegetable Pancake an extra edge. I think it’s a brilliant idea Minoo had of the tuna topping. I can imagine how rather ho-hum this would be without this extra topping. 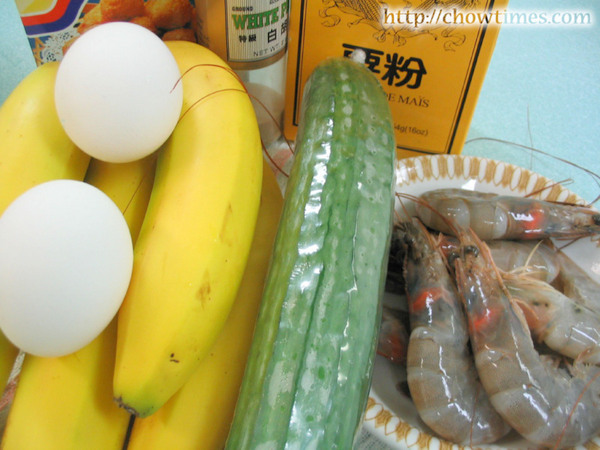 Banana and shrimp does not normally mix, does it? However, these Banana Shrimp Cakes are great finger food. 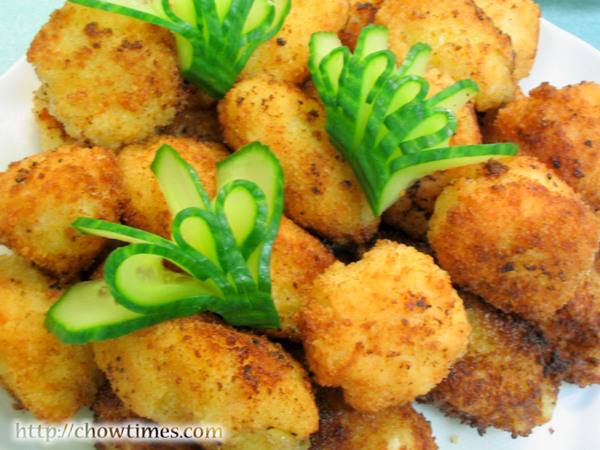 They are crunchy on the outside and soft, sweet and savory on inside. 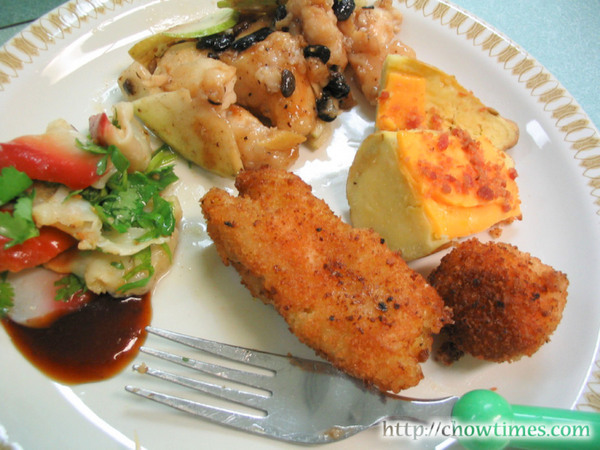 The Banana Shrimp Cake will go great with almost any type of sauce dip. 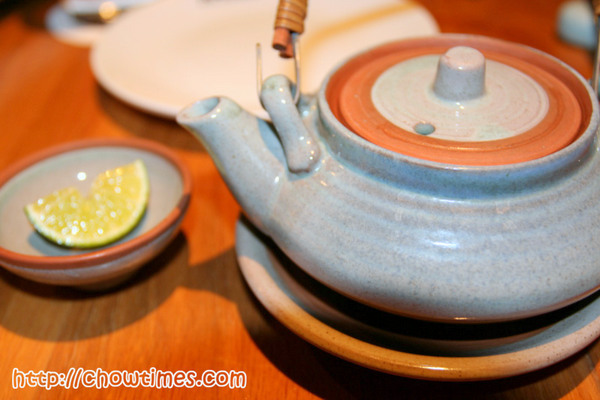 This is a very Chinese homey dish. 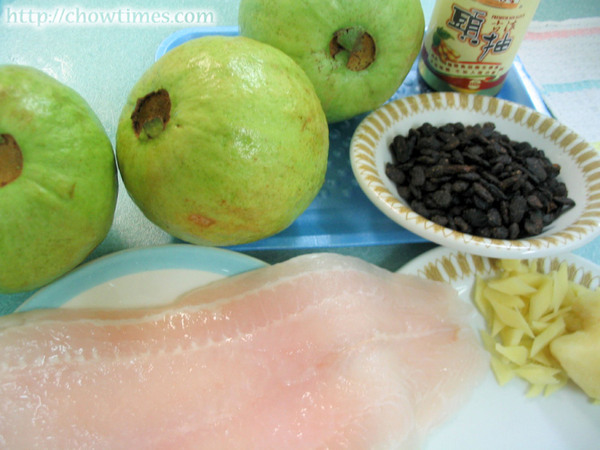 My kids will certainly love the fish fillet with the fermented soy bean. 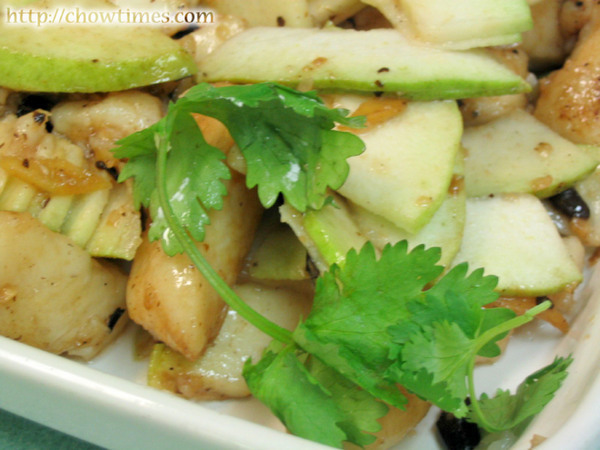 The guava gives this dish a unique flavour. 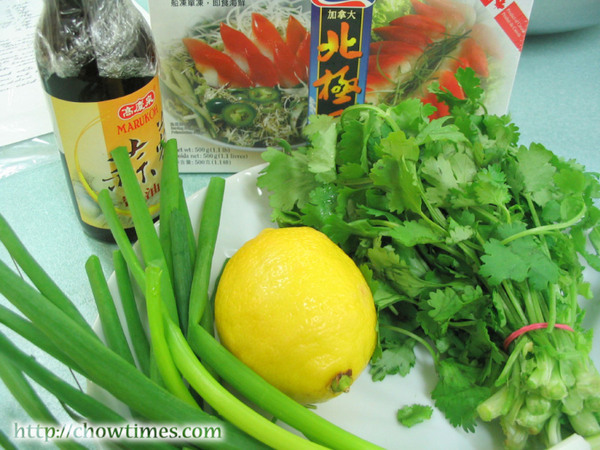 You may substitute the guava with other vegetables like zucchini, cucumber, etc. The Arctic Surf Clams is great as an appetizer. It is best served cold. 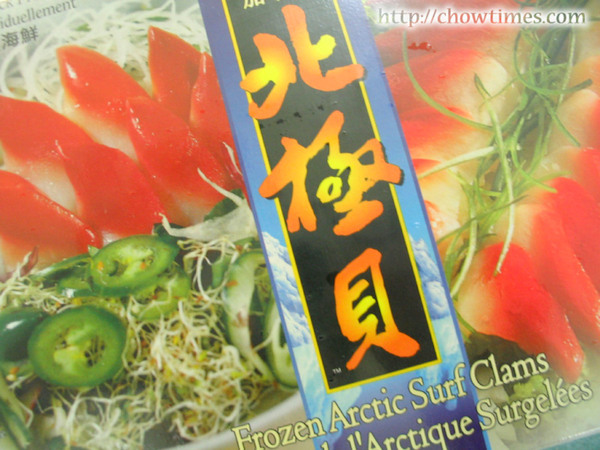 You can buy frozen, ready cooked Arctic Surf Clams from Asian Supermarket like T&T in Vancouver. Lorna cooked up a storm in the South Arm Community Centre cooking class. We used to only make a dish or two during the classes. This time she made a record breaking four dishes. I like this because it gives me more materials to blog about! When we first started our blog, we always mulled over what we want to blog for the next day but today, we had almost one month worth of blog postings waiting to be posted. So, Ben had been insisting that we release more blog entries every day but no-can-do! 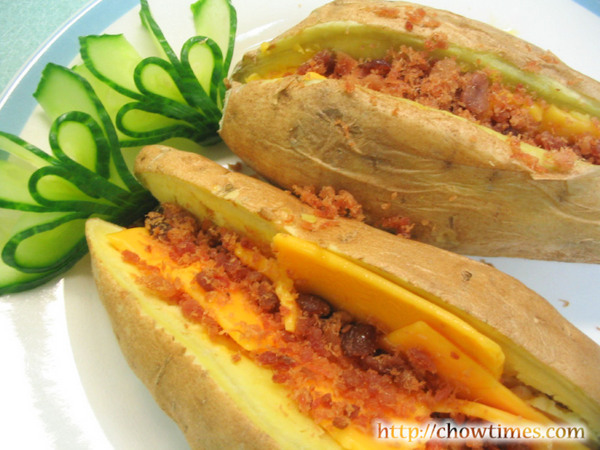 Yam with Cheese and Bacon Bits. Just the names alone sounds so appetizing, doesn’t it? Well, it sounds good, it looks better and let me tell you, it tastes great! We had a mini buffet after the cooking class. All the dishes were so absolutely yummy. I was so full that I had to skip my dinner that day. 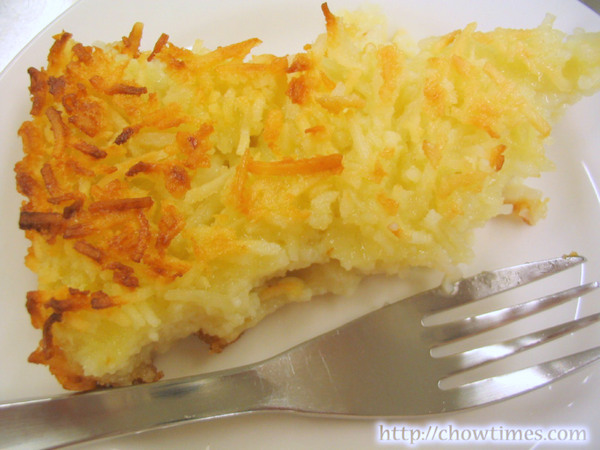 The first dish is very simple and quick to make — it is called Yam with Cheese and Bacon Bits. Lorna told us that she makes this as breakfast for her family. The whole yam is microwaved until it is soft and is then top with cheese and bacon bits. If you have more time, the yam can be baked in the oven until it caramelized and becomes very sweet. I will post the recipes for the rest of the cooking Lorna demonstrated over the next few days. Lorna, thanks for sharing such great recipes. We surely learned a lot today. Thanks for enduring my many postings on my trip to Singapore and Malaysia. This is the final posting in this series. From tomorrow I am gonna take a long rest from blogging and pass the baton over to Suanne. It was just a 2 week trip but did manage to blog 28 entries in all. Wow, Suanne had not blogged for 4 straight weeks — that’s not fair! 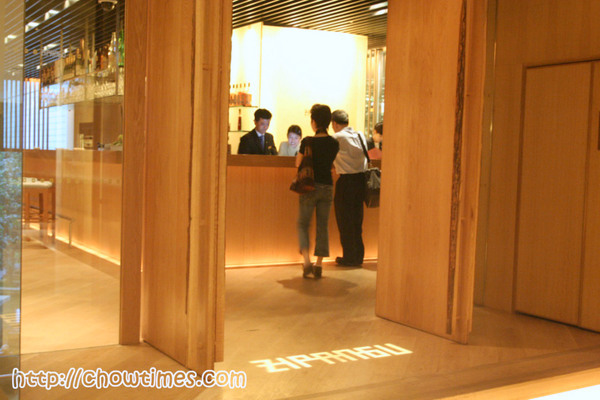 Joyce treated me to dinner at the Zipangu Japanese Restaurant in the Shangrila Kuala Lumpur. The Shangrila KL is perhaps still the No 1 hotel in KL. It used to have been voted as the No 1 hotel in the world. Joyce had a corporate membership in the hotel. For that she gets 50% off. We were deciding over whether we should go for the RM$98 (US$ 25+) Buffet or try something different. We opted for the Japanese restaurant because there were a long queue at the buffet restaurant waiting to break fast (it was Ramadhan then). The entrance were grand. 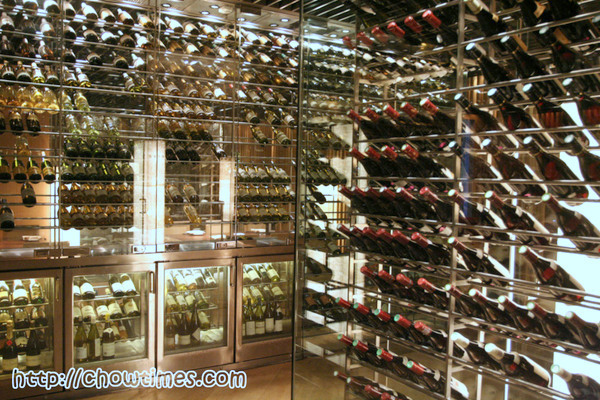 We had to wind our way along walls of wine. Pretty amazing and I was thinking … gosh! how much is this meal gonna cost!! The restaurant were impressively laid out. We could see the kitchen at work from where we were. 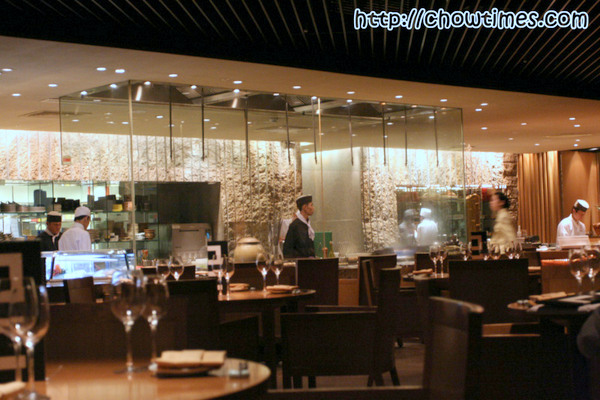 This is so authentically high end Japanese restaurant. The service were prompt. They must have the best waiters and waitresses in the entire city. They not only looked pretty/handsome but they do come across as very intelligent and professional. Joyce and I could not recognize most of what was in the menu. So, we opted for the Set Dinner. Each set dinner costs RM98, same price as the buffet. I went for the Tempura Set Dinner while Joyce chose the Salmon Set Dinner. What came first was a tea pot for each of us! I initially thought that it was tea. On my last full day in Malaysia, I brought my niece and nephews for brunch in the neighborhood shopping mall. 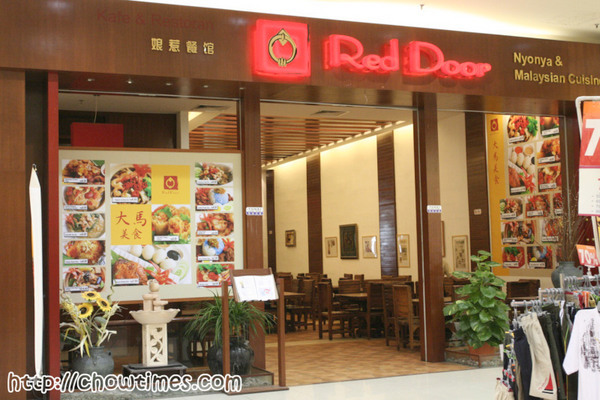 It was only about a 5 minutes drive to the Jusco shopping mall in Kepong. There were a lot of choices at the mall and it took us a while to decide where to eat. We came across the Red Door. What enticed us was the big poster of their menu. 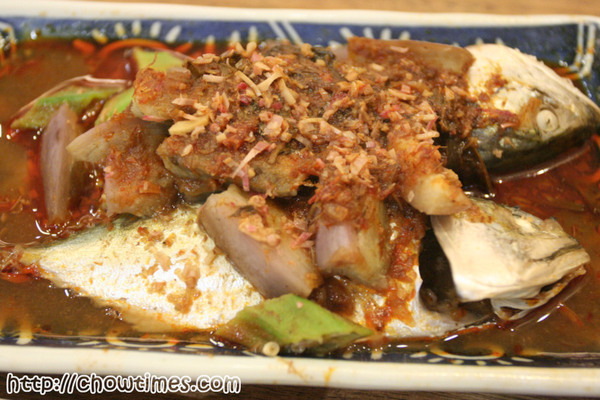 They serve mainly traditional Malaysian food, specifically Nyonya cuisine. Oh yeah, I had always wanted to say this. 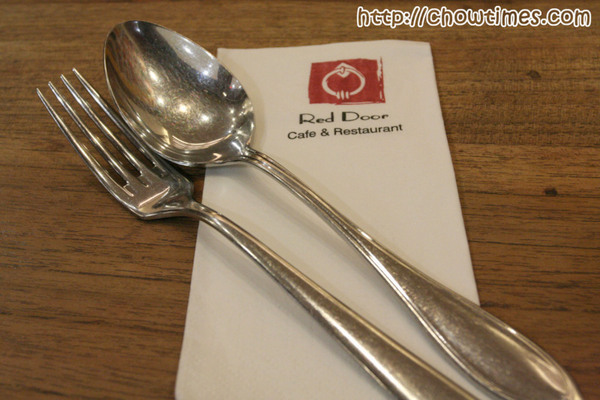 In Malaysia, the standard cutlery is a spoon and a fork for almost all food except for noodles. When I first came to Canada, it took me a while to get used the cutleries issued, which is just a fork and knife. We got to ask for a spoon. Canadians used a fork even for rice where in Malaysia, the spoon is used to scoop up the rice and the fork is to push food onto the spoon. I ordered the Sambal Fish Rice. This dish came with two fish about 8 inches long. Don’t know what type of fish this is though. The chilli sauce is a bit sourish and certainly spicy. The okra (known better as ladies fingers in Malaysia) and eggplant (or Brinjal) adds a good balance to the spicy-sourish taste to the chilli. 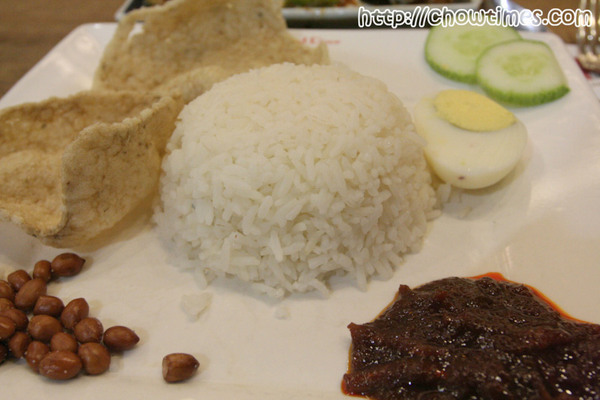 The Sambal Fish Rice came with prawn crackers, fried peanuts, eggs and the sambal. I like mixing it all up before diving in. This dish costs RM9.80 (less than USD $3). Met up with James over lunch in PJ. He suggested Chicken Rice near his work place and so I made my way to PJ after spending the morning in KL downtown and the Central Market. I wanted to post yet another non-food entry but decided, no, I should just stick to food! If I recall correctly, this restaurant is called the New Ipoh Chicken Rice. 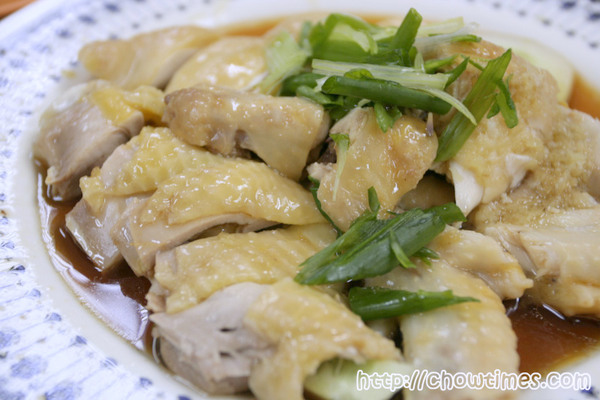 In chinese, it’s better known as nga-choy-gai (chicken with bean sprout), This is a typical Hainanese Chicken Rice dish. 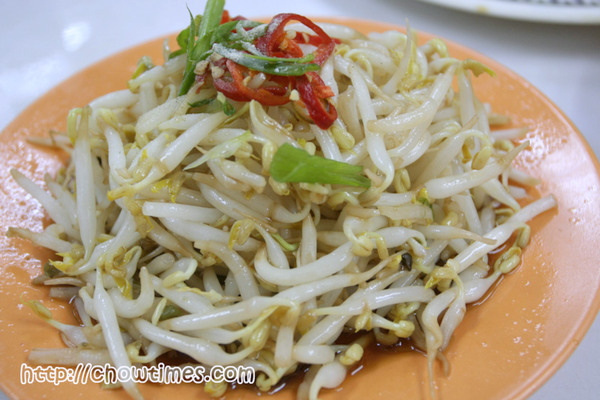 The bean sprout is a specialty of Ipoh which produces beansprouts quite unlike those you find elsewhere in the country. Ipoh people believes that this is because the hard water in Ipoh makes their beansprouts particularly tastier. We had a choice of the normal farmed chicken or the kampung (village) chicken. The kampung chicken are leaner because they are not couped up in dens and are left to run freely. We ordered the kampung chicken to share. I ordered their “oiled” rice (yow-fun). 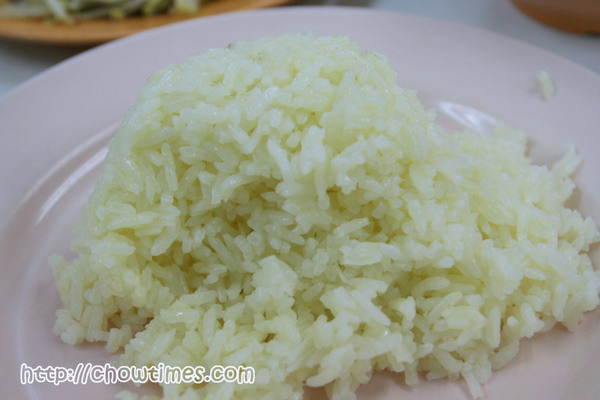 It’s steamed rice and mixed with the chicken fat. It give a really nice aroma and flavour. It must have been a special birthday for my mum this year. 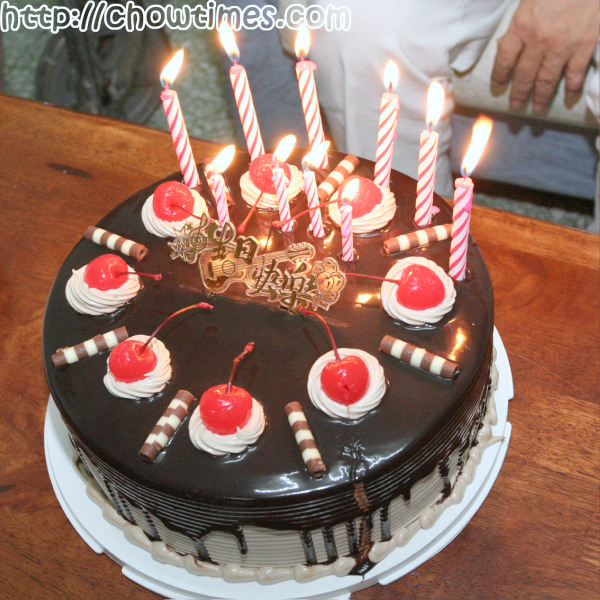 It had been many years since she had all her three children present to celebrate her birthday. I can see the gladness in her eyes that I was there this year. To me, my mum had gone through a lot. I did witness some ups and downs. She was never a person who would let us know her problems — I wish she would be open. I will always remember her sacrifices for me and making sure that I had what I needed over her own needs. She does not ask for much at all. When I was in my teens, I had a serious car accident in which I almost died. Mum was there in the hospital with me every day — even though she had to travel almost a hundred kilometers to bring me lunch. That is because she wanted me to have better food than what was served in the hospital. My brother bought a coffee flavoured birthday cake for her. My sister came around too with her kids. So did my dad’s youngest sister. I can guess what her birthday wish was for … must have been wishes for others more than for herself! After the cake at home, we decided to go out for dinner. For nostalgia sake, we decided on going to a favourite restaurant of ours. Leong Ya had been in business since I was really young. I remember that the family took a long drive on weekends every now and then. Back then Leong Ya operated from a shack and their specialty was Yong Tau Foo and Paper Wrapped Chicken. Their business grew over the years until the time when they moved to a building of their own. Their business was so good that one had to endure long waits for a table and then wait for like 30 minutes before they come by to take our orders! However, Leong Ya had seen better times. They are now operating from a shoplot and a lot more smaller than it used to be. When we were there, there were only four tables of customers. The guy who come around to take our orders (yeah, the one who we had to wait for 30 minutes! ), is still there. 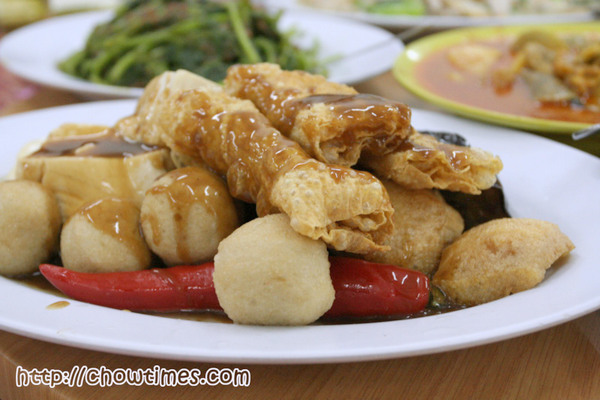 We ordered some Yong Tau Foo, which is a variety of fish paste filled food.